Table 7 Late-glacial and Postglacial succession of Fife and Tayside. Figure 3 Marginal drainage channel, Walton Hill, Cupar, formed by meltwater flowing eastwards at the margin of Stratheden ice during the retreat stages of the Late Devensian ice sheet. Though no sedimentary rocks of post-Carboniferous and pre-Pleistocene age occur in this area, Geikie (1902, p. 21) and George (1960, p. 93) both believed that a cover of very uncertain thickness of Mesozoic and possibly Tertiary rocks extended over part at least of the Midland Valley of Scotland. However, recent work in the offshore areas on both east and west coasts of Scotland suggest that this is not so except perhaps in the Clyde Estuary. There is little to suggest that either Mesozoic or Tertiary sediments were ever deposited in the Fife and Angus areas although Permian sediments do occur only a few kilometres east of the Angus coast (Tayforth sheet 56N 04W 1/250,000 – BGS 1986). Quaternary sediments are, on the other hand, very abundant and these will now be considered. The area shows signs in many places of a complex glacial history which has been by no means fully worked out. In common with much of Northern Europe the area underwent a series of glaciations during which it was entirely covered by ice. However, the best evidence for this has been obtained not on land but offshore. The surface waters of the oceans contain large populations of temperature-sensitive planktonic foraminifera, both warm- and cold-water species. On death their tests or shells fall to the ocean floor. Successive layers of ocean floor sediment thus point to periods of both warmer and cooler surface waters in the oceans even far from glaciated areas. The oxygen isotope composition in the calcium carbonate content of the foraminiferan shells is also temperature related and confirms the evidence from the actual species present that there have been very many cold periods during the Quaternary. The evidence points to major fluctuations in the water masses in the oceans. More specifically, so far as Scotland is concerned, southward movement of polar water, and in particular movement of the polar front, is involved with attendant climatic deterioration. This in turn is likely to have affected the atmosphere and through it the precipitation necessary for rapid ice growth (Bowen 1991, p. 3). Despite the almost overwhelming evidence offshore for many glacial stadials or episodes there is within Scotland very limited evidence of this on land. Interglacial sediments are rare and difficult to interpret, e.g. in Buchan in North-East Scotland (Hall and Connell 1991). It appears that the last major ice sheet, that of the Late Devensian, removed much of the evidence of what went before from most of the land area of Scotland. This last major ice sheet lasted from around 26,000 BP (= before present, taken as 1950 AD) to c. 14,000 BP (Bowen 1991, p. 8). From 1.8 My — the beginning of the Quaternary to around 26,000 BP almost nothing remains in Scotland except in the north-east (Hall and Connell, 1991). Of the Late Devensian ice sheet we have both direct and indirect evidence. Sutherland (1991) has summarized this. Except in the north of Lewis the western limits of the ice sheet are unknown. To the east, the Wee Bankie Moraine in the North Sea, locally as little as 25 km offshore, marks the eastern limits. The ice formation was polycentric and the thickness of the ice sheet is unlikely to have exceeded 1300 m. So far as Fife and Angus were concerned the Eastern Grampians were an early established centre while the Western Highlands became increasingly important later. Trewin et al. (1987, p. 47) suggest that tills containing Scandinavian erratics in North-East Scotland may have incorporated ice-rafted blocks from pre-Late Devensian times. Over Fife and Angus, Highland ice is the only ice with which we need be concerned. Glacial striae are found on the more resistant rocks and indicate a broadly eastward flow of ice. The distribution of erratic blocks confirms this, since blocks of Highland metamorphic rocks are found scattered over many parts of Fife and great blocks of quartz-dolerite from the sills further west now lie in many parts of the East Neuk of Fife. In the Carse of Gowrie ice striae are aligned to the ESE gradually swinging round to east by Dundee and slightly north-east by Broughty Ferry. As far north as Montrose there is still an easterly trend for ice movement (Sutherland 1991, Fig. 21, p. 56). Within this major ice sheet the following routeways of several distinct ice streams can be recognised. A Forth glacier lying mainly in the Firth of Forth and flowing eastwards with a branch passing east between the Ochil and Lomond Hills past Kinross and down Stratheden. Drumlinised till in Lower Stratheden and east of St Andrews provide evidence for this (Forsyth and Chisholm 1977, pp. 233– 4). In Stratheden this was augmented by ice from the north side of the North Fife Hills, where striae are from the northwest. Carse of Gowrie ice seems to have been derived from Strathearn in the west as well as from the north-west. Blocks of diorite from Glen Lednock are not uncommon in the fluvioglacial deposits at Wormit and indicate a westerly source. Around Perth striae are more commonly from the WNW, as they are too in the Sidlaws. Further east at Dundee, crag and tail features such as Dundee Law point to an eastward movement of ice as do the striae at Wormit. 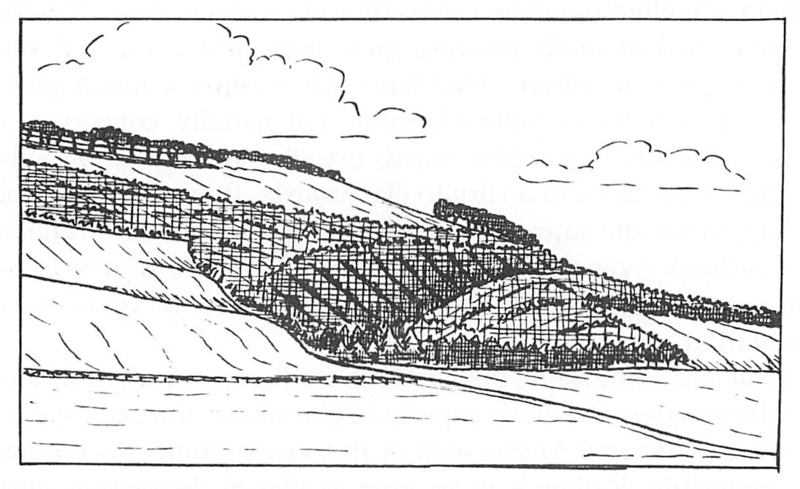 At Broughty Ferry crag and tail features are aligned north of east (Armstrong et al. 1985, fig.14). Striae in the Sidlaw Hills north-west of Dundee indicate that ice from the Highlands must have crossed Strathmore and the Sidlaws from the north-west. As this flow diminished, ice from the Tay and from much further west must have flowed north-east up lower Glen Isla into Strathmore, a direction confirmed by the north-east-trending drumlins northwest of the Sidlaws (Armstrong et al. 1985, p. 71). Small glaciers in Glens Ardle, Shee, Isla, Prosen, Clova, Lethnot and Esk while active early on (Hall and Connell 1991, p. 134), latterly do not appear to have made any contribution to Strathmore ice. Red Strathmore till, deriving its characteristic colour from the Lower Old Red Sandstone over which the ice passed, extends for some distance up many of the glens: indeed Bremner (1934) records its occurrence 6.5 km up Glen Clova beyond the Highland Boundary Fault and has given similar figures for the Lethnot and Prosen valleys. The limit of penetration has, however, decreased to 1.5 km by the time Glen Bervie is reached, thus implying a south-west source for the Strathmore ice. To the north lay the large Dee Glacier which occasionally overflowed across the 'watershed' into the northern part of the area normally occupied by Strathmore ice. Till was defined by Rice (1988, p. 245) as 'sediment deposited directly from ice' and the term is used here with that meaning. While ice from different sources can be recognised principally by the nature of erratic blocks that it carried, and by the glacial striae on unweathered bedrock over which it passed, its direction of movement can also be deduced from the orientation of clasts in lodgement till – the till which has been plastered onto the underlying bedrock by the overriding ice. The matrix, often of clay, can also yield information as to its source area. For example, the Strathmore till laid down by ice travelling over the outcrop of the Lower Old Red Sandstone is usually bright red in colour, whereas the till from the ice which travelled over the Carboniferous rocks in Fife contains a great deal of finely-ground, grey shale and even coal and is dark grey in colour. 'Highland' till is often a much paler grey or sometimes yellow-brown. Till usually comprises a range of pebble to cobble sized, usually subangular to sub-rounded, particles in a silty to clay matrix, though this can be sandy where the source is sandstone. The composition reflects the bedrock over which the ice has passed since much of the till is a product of ice erosion, and is often of quite local derivation. Price has remarked (1983, p. 66) that 'there are large parts of Scotland where dramatic aspects of glacial erosion are absent'. Over the Fife and Angus area of this guide book this remark is applicable. Rather it is an area of glacial deposition with widespread cover of till or fluvioglacial sand and gravel. Morainic ridges are rare to virtually absent and this is characteristic of areas covered by a major ice sheet (Rice 1988, p. 247) rather than one of valley glaciation. A small number of drumlins have been recognised (Armstrong et al. 1985) north and east of Perth, north of Dundee and in Strathearn, as well as those in East Fife. They are aligned parallel to the direction of ice movement. In East Fife the rather featureless, ice-moulded, drumlinised drift is up to 20 m thick but usually much thinner and is often cut through by streams along which the bedrock is now exposed. It is normally brownish-grey in colour, but in North Fife is often more reddish (Forsyth and Chisholm 1977, pp. 233–5). (i) The meltwater from the downwasting Late Devensian ice sheet redistributed much of the till, removing the finest material ultimately to the sea and reworking the sand and gravel sized material. Material was transported over, through and under the ice in this way and the resulting fluvioglacial sediments, widespread on both sides of the Tay, are now seen as kettled outwash plains. 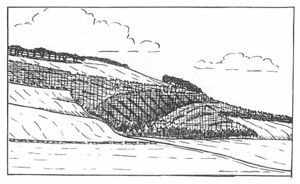 In Fife and Kinross such deposits occur around Loch Leven extending almost continuously down Stratheden past Auchtermuchty and Cupar to Leuchars where they merge with those of the Wormit Gap (Excursion 5), associated with Carse of Gowrie ice in the Tay. At Collessie too, fluvioglacial sediments in Stratheden have been augmented by sediment carried southwards by meltwater from the Carse of Gowrie through the Newburgh Gap, past the Loch of Lindores, and spread out round the villages of Collessie and Letham. To the south of the Stratheden sands and gravels there is an extensive spread of sands and gravels from Leslie through Markinch to Kennoway. Fluvioglacial deposits extend up Strathearn to Crieff, lie north of Perth, and are widespread in many parts of Strathmore, e.g. around Coupar Angus, Glamis, Forfar, Brechin, Edzell and Drumlithie where they represent outwash from the Highland glens. On the coast they occur at Monifieth, Arbroath, the Lunan Water and the Montrose Basin. Eskers, gravel ridges, kame terraces and kettle holes are all well displayed in the Wormit–Leuchars area in north-east Fife (Excursion 6). (ii) During the melting of the Late Devensian ice, as land appeared above the ice, so many channels were cut in what are clearly now anomalous positions relative to the present-day drainage pattern. Most are now dry or are occupied by small misfit streams. Some were probably ice marginal, others may have been subglacial. Some are very steep and again may have been subglacial. (Sissons et al. 1966, p. 43.) In Fife several occur at Upper Largo, marginal to Forth ice; others are developed at the margin of Stratheden, e.g. at Walton Hill and Cults south-west of Cupar (Knox 1962) see (Figure 3). A large number were mapped by Armstrong et al. (1985 e.g. Fig.14) between Methven, west of Perth, through the Sidlaws, past Dundee to Carnoustie and Arbroath. In the Stonehaven to Aberdeen coastal section several major channels occur apparently coming in from the sea, dropping northwards and returning seawards but still well above sea level (Bremner 1925). Others have been mentioned in the glens tributary to Strathmore by Charlesworth (1955, p. 784) (Excursion 2). Raised beaches are common round the coast (e.g. Excursion 9, Excursion 15). They represent old shorelines and indicate that sea level was once relatively higher than it is now. From (Table 7), it will be seen that they formed at a number of different times. These old shorelines represent the results of a complicated sequence of events which took place on a number of occasions following the late-Devensian ice maximum. During each period of build-up of ice on land the earth's crust was isostatically depressed by the weight of ice, the depression being greatest where the load of ice was greatest. Simultaneously, abstraction of water from the oceans to form ice sheets, often of vast size such as the Laurentian Ice Sheet in North America and the Scandinavian Ice Sheet in Europe, lowered sea level worldwide by 100 m or more. When the ice melted the land began to rise as a result of isostatic readjustment or rebound, but the concurrent rise in sea level was relatively much faster. There was therefore an early rise of relative sea level. Thus early formed shorelines were uplifted as the land continued to rise so that they are often high above present day sea level. Successive shorelines represent usually brief episodes of relative land/ sea level stability, long enough for shoreline features to develop. Isostatic readjustment was greatest where the ice was thickest and depression greatest, so that an old shoreline may be expected to have been uplifted more where the ice was thicker. Such shorelines are therefore tilted. Moreover older shorelines will be more tilted than younger ones in the same area, having undergone differential uplift for a longer period of time. This is clearly seen in East Fife where the oldest shorelines have a gradient as they rise westward of 1.26 m /km while the gradient of the youngest is only 0.076 m/km (Sissons 1974, p. 328) (Table 7). The thickest part of the Devensian ice sheet in Scotland lay to the west of the area dealt with in this guide book. Uplift has therefore been greater in the west and individual beaches may be expected to rise when traced westwards. So too within this area younger beaches extended further west than old ones on account of the westward recession of the Late Devensian ice sheet (Browne et al. 1981, p. 8). The arguments for tilted raised beaches were presented by Sissons (1962) and have since been abundantly confirmed by many workers in this area, e.g. Sissons et al. (1966) or Armstrong et al. (1985). Precise surveying and levelling of beaches at many thousands of sites particularly in the Forth and Tay Estuaries and Strathearn have allowed both widely recognised and quite local raised beaches to be integrated into a late-glacial history of the area, including the stratigraphy of the marine and estuarine sediments of the Tay–Earn area. In addition the micropalaeontology of the sediments and radiocarbon dating of the interbedded peats have allowed detailed palaeoenvironmental and palaeoclimatic analysis of the late Quaternary. The oldest raised beaches known in the area are found in East Fife where they extended intermittently from Fife Ness to the St Andrews area. Cullingford and Smith (1966) described these beaches as passing west into fluvioglacial outwash beyond which they cannot be traced. They have also correlated the high Fife Ness to St Andrews shore lines with those of the Anstruther–Leven area but no further west. Cullingford and Smith (1980) presented a further correlation of these East Fife raised beaches with those known between Dundee and Stonehaven, all pointing to westward retreat of the Late Devensian ice sheet and Sutherland (1991) suggested dates of 16,000 to 14,000 BP for the period of ice wasting. 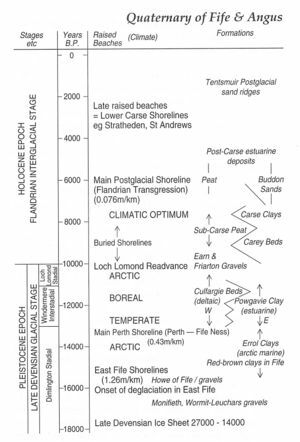 Within the Tay Estuary marine clays frequently lie directly on either bedrock or till and were apparently deposited 'as soon as the westward retreat of the ice-front permitted and continued for an extended period' (Paterson et al. 1981, p. 7). 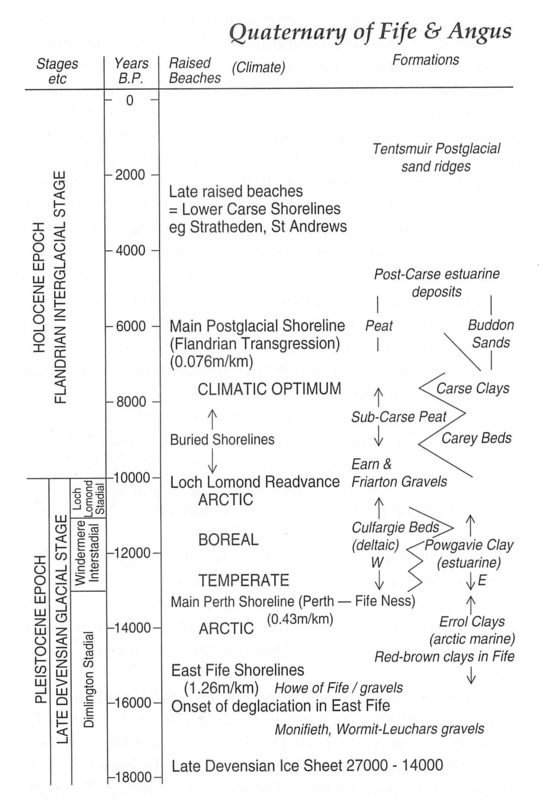 These clays, the Errol Beds, contain a long-known arctic fauna (Paterson et al. 1981) and also contain a large number of boulders, many of them striated, and interpreted as drop-stones from floating ice. It seems likely (Paterson et al. 1981, p. 7) that the oldest Errol Beds east of Dundee predate the lowest of the old East Fife shore lines of Cullingford and Smith (1966). Errol Bed clays are known as far west as Almond Bridge north-west of Perth suggesting that they were deposited in front of the retreating Late Devensian ice sheet, as a result of a rapid rise in sea level to at least as high as 40 m OD near Abernethy. Analogous 'arctic clays', the 'plastic clays' of Forsyth and Chisholm (1977, pp. 237–47), are present in both the St Andrews and the Elie areas of East Fife. Controversially Browne et al. (1981) suggested that foraminifera-bearing, red, laminated clays far to the west at Ladybank in Stratheden also represent deposits contemporary with the Fife Ness shorelines and deposited when the sea invaded the Howe of Fife. Isostatic uplift resulting from the melting of the Late Devensian ice sheet became more important at this stage (around 13,500 Br) so that relative sea level fell and the ensuing Main Perth Shoreline is widely recognised. It has a gradient of 0.43 m/km, slopes down from west to east and has been recognised east from Perth most of the way to Fife Ness and in the Firth of Forth west almost to Stirling. Cullingford and Smith (1980, p. 28) found that the evidence for this beach north of the Tay 'poses problems'. The sediments associated with this beach, the Powgavie Clay, which is known only from boreholes, are fossiliferous and were deposited under significantly less frigid climatic conditions than the Errol Beds, though still colder than at present (Armstrong et al. 1985, p. 85). Landward the Powgavie Clay passes into the sandy Culfargie Beds exposed around Bridge of Earn and Glencarse–Errol. North of Perth laterally equivalent beds comprise both sand and gravel and are probably fluvioglacial. A number of Lower Perth Shorelines, mainly known from boreholes, point to continuing uplift and thus to falling late-glacial relative sea level. As a result of this fall erosion became widespread, cutting into the late-glacial sediments; indeed channels have been cut to at least 29 m below OD, e.g. at Friarton Bridge, Perth. It is believed that this period of erosion immediately preceded the Loch Lomond Stadial (see below) but Armstrong et al. (1985, p. 88) have suggested that gullies cut into the late-glacial sediments might have been formed by headward erosion under periglacial conditions. In this case a Loch Lomond Stadial age would seem likely. The Loch Lomond Stadial (10,800–10,000 BP), is marked in the west of Scotland by a fresh development of an ice cap and valley glaciers up to 50 km in length, the Loch Lomond Readvance. In the East of Scotland pronounced features of this age are lacking but the details have been discussed by Armstrong et al. (1985, pp. 87–9). Suffice it to say that sands (the Carey Beds) and gravels have been assigned to the late stages of this period within the Tay Estuary. The next widely recognised formation is the diachronous Sub-Carse Peat (9945–7605 BP) with terrestrial vegetation. At Culfargie near Bridge of Earn this peat is at +2 m OD and at New Farm, Errol it lies at +4.7 m OD, whereas at the Tay Bridges, Dundee it is below sea level. Armstrong et al. (1985, p. 90) suggest that the lowest sea level of the postglacial period was reached at around 8,000 BP. Thereafter eustatic sea level rise was faster than isostatic uplift and caused a widespread marine transgression in east Scotland. This, the Postglacial or Flandrian Transgression, reached its maximum at around 6,000 BP in the Forth, at 6,100 in the Carse of Gowrie, 5,900 in North East Fife, 6,700 at Montrose and 5,700 near Fraserburgh (Price 1983, p. 161); the resulting Main Postglacial Raised Beach is a widely recognised feature with a gradient of 0.076 m /km and extends from Stirling to Fraserburgh (Price 1983, p. 160). The associated sediments often comprise estuarine clays, silts and sands and are known as the Carse Clays. A basal pebble bed is exposed at the Eden Estuary. The sediments have yielded a largely temperate fauna of invertebrates and have been dated with reasonable accuracy on account of their not only resting on the Sub-Carse Peat but their being overlain at a number of localities by a younger peat. This too has yielded radiocarbon dates, ranging from 6,170 BP (Morrison et al. 1981) in the upper Carse of Gowrie to 5,830 BP (Chisholm 1971) at St Michael's Wood, Leuchars. This upper peat over the Carse Clay points to isostatic uplift being once more greater than eustatic sea level rise and hence a renewed fall in sea level. It has resulted in the wide Carselands of the Tay and Forth Valleys with lesser areas for example at the Montrose Basin. In two areas it has been shown that the Carse Clays give way eastwards to marine sands. This takes place both in the Tentsmuir–Leuchars area (Chisholm 1971) and across the Tay around Buddon Ness (Armstrong et al. 1985, p. 92). Isostatic uplift has continued since the Flandrian Transgression and the formation of the Main Postglacial Raised Beach and lower shorelines have been documented for example in the Tay Estuary (Armstrong et al. 1985, fig.15). At St Andrews one such is particularly well displayed on the North Haugh at 3–4 m OD. Subsequently uplift seems to have come to a standstill and the tidal gauges at Dundee indicate that sea level has remained constant over the last two hundred years. BOULTON, G. S., PEACOCK, J. D. and SUTHERLAND, D. G., 1991. Quaternary. In CRAIG, G. Y. (Ed.) Geology of Scotland. 503–43. Geological Society, London. BOWEN, D. Q., 1991. Time and space in the glacial sediment systems of the British Isles. In EHLERS, J. et al. (Eds) Glacial deposits in Great Britain and Ireland, 1–12. Balkema, Rotterdam. BREMNER, A., 1925. The glacial geology of the Stonehaven district. Trans. Edinb. Geol. Soc., 11, 25–41. BREMNER, A., 1934. Meltwater Drainage Channels and other Glacial Phenomena of the Highland Border Belt from Cortachy to the Bervie Water. Trans. Edinb. Geol. Soc., 13, 174–5. BROWNE, M. A. E., ARMSTRONG, M., PATERSON, I. B. and AITKEN, A. M., 1981. New evidence for Late-Devensian marine limits in East-Central Scotland. Quat. Newsletter, 34,8–15. CHARLESWORTH, J. K., 1955. The late-glacial history of the Highlands and Islands of Scotland. Trans. Roy. Soc. Edinb., 62, 769–928. CHISHOLM, J. I., 1971. The stratigraphy of the post-glacial marine transgression in N.E. Fife. Bull. Geol. Surv. Gr. Br., 37,91–107. CULLINGFORD, R. A. and SMITH, D. E., 1966. Late-glacial shorelines in Eastern Fife. Trans. Inst. Br. Geogr., 39, 31–51. CULLINGFORD, R. A. and SMITH, D. E., 1980. Late Devensian raised shorelines in Angus and Kincardineshire, Scotland. Boreas, 9, 21–38. FORSYTH, I. H. and CHISHOLM, J. I., 1977. The geology of East Fife. Mem. Geol. Sum Gr. Brit. GEORGE, T. N., 1960. The stratigraphical evolution of the Midland Valley of Scotland. Trans. Geol. Soc. Glasg., 24, 32–107. HALL, A. M. and CONNELL, E. R., 1991. The glacial deposits of Buchan, north-east Scotland. In EHLERS J. et al. (Eds). Glacial deposits in Great Britain and Ireland, 129–36. Balkema, Rotterdam. KNOX, J., 1962. Strand lines at 140 and 190 feet in the Howe of Fife. Trans. Edinb. Geol. Soc., 19, 120–32. MORRISON, J., SMITH, D. E., CULLINGFORD, R. A. and JONES, R. L., 1981. The culmination of the Main Post-glacial Transgression in the Firth of Tay area, Scotland. Proc. Geol. Assoc., 92, 197–209. PATERSON, I. B., ARMSTRONG, M. and BROWNE, M. A. E., 1981. Quaternary estuarine deposits in the Tay–Earn area, Scotland. Rep. Inst. Geol. Sci., No.81/7. PRICE, R. J., 1983. Scotland's environment during the last 30,000 years. Scottish Academic Press, Edinburgh. RICE, R. J., 1988. Fundamentals of geomorphology (2nd Ed). Longman, Harlow. SISSONS, J. B., 1962. A reinterpretation of the literature on Late-glacial shorelines in Scotland with particular reference to the Forth area. Trans. Edinb. Geol. Soc., 19, 83–99. SISSONS, J. B., 1974. The Quaternary in Scotland: a review. Scot. Jour. Geol., 10, 311–37. SISSONS, J. B., SMITH, D. E. and CULLINGFORD, R. A., 1966. Late- glacial and Post-glacial shorelines in south-east Scotland. Trans. Inst. Br. Geog., 39, 9–18. SUTHERLAND, D. G., 1991. Late Devensian glacial deposits and glaciation in Scotland and the adjacent offshore region. In EHLERS, J. et al. (Eds) Glacial deposits in Great Britain and Ireland, 53–9. Balkema, Rotterdam. TREWIN, N. H., KNELLER, B. C. and GILLEN, C., 1987. Excursion guide to the geology of the Aberdeen area. Scottish Academic Press, Edinburgh. This page was last modified on 23 February 2019, at 17:28.